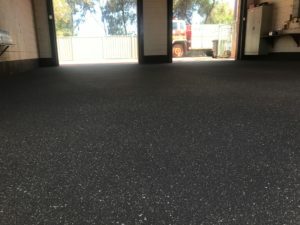 Although a large part of the resurfacing we do revolves around outdoor projects like roundabouts, islands and footpaths, we recently travelled the 1200 kilometres to Newman in the Piblara to complete a floor-resurfacing project. 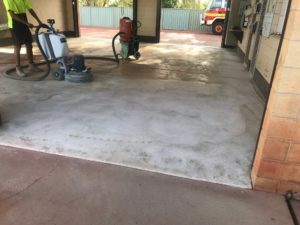 The volunteer fire brigade in Newman approached us to resurface and reinvigorate their flooring. This job not only included the resurfacing, but also grinding down 35 years and five coats of paint from the original concrete floor. We were able to complete the project on time and within budget, all the while exhibiting our trademark exceptional attention to detail. As shown in the images, the whole process from start to finish was completely seamless. From our staff grinding down the paint, to the beautiful resurfaced result, the finished project met our client’s needs to a ‘T’. To rejuvenate the flooring while also maintaining the functionality and aesthetic quality of the project, we used our Parchem Avista Resurfacing system in the Bluestone colour. This was used in conjunction with a polyurethane sealer, a heat resistant sealer essential to keep he volunteers safe. Like always, our resurfaced flooring is slip resistant and includes a fungicidal additive to inhibit the growth of lichen, mould and moss. All of these features ensure that we provide durable and superior flooring for all of our customers. No matter what project we undertake, we go above and beyond for our clients to achieve the results they want. Our high standard of workmanship, along with the remarkable and long lasting quality of the materials we use means that our customers are always left satisfied with the results. So, whether you need to resurface commercial flooring, a speed bump or anything in between, get in touch with the Wespray on Paving team today to ensure your next commercial project is completed with the quality and attention you need.